Hit the jump for more on the film, including story and casting details. Though the script is being kept tightly under wraps, Rodriguez previously revealed that the plot will involve three separate stories from Miller: A Dame to Kill For and two new ones that have yet to be announced. Casting is set to begin next week with much of the original cast returning, but Miller’s graphic novel A Dame to Kill For heavily features the character of Dwight, played by Clive Owen in the 2005 film, so I presume he’ll be back. Miller wrote the first draft of the screenplay, which was rewritten by The Departed scribe William Monahan before going back to Miller for one last pass. 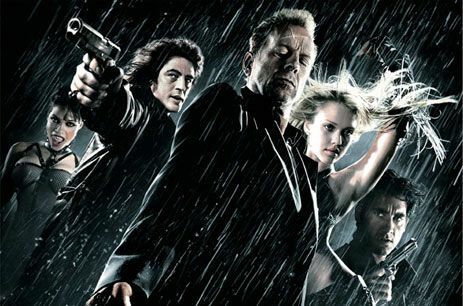 Filming on Sin City: A Dame to Kill For is set to get underway this summer, presumably after Rodriguez wraps the Machete sequel, Machete Kills Again. He previously stated that the knife-heavy follow-up would begin filming in April, and given how quickly Rodriguez shoots in his studio down in Austin, it’s entirely feasible that he could make both movies this year. With casting beginning next week, we should hear quite a bit more about the film in subsequent weeks. I’ll be interested to see just how many actors from Sin City really do show up given how long it’s been since the original. Nevertheless, I’m still in a bit of shock that Sin City 2 is actually happening. Read the full press release below.